We are getting into the days when hearty casseroles and warm cheesy things are starting to sound like a good idea again. My absolute favorite time of year. 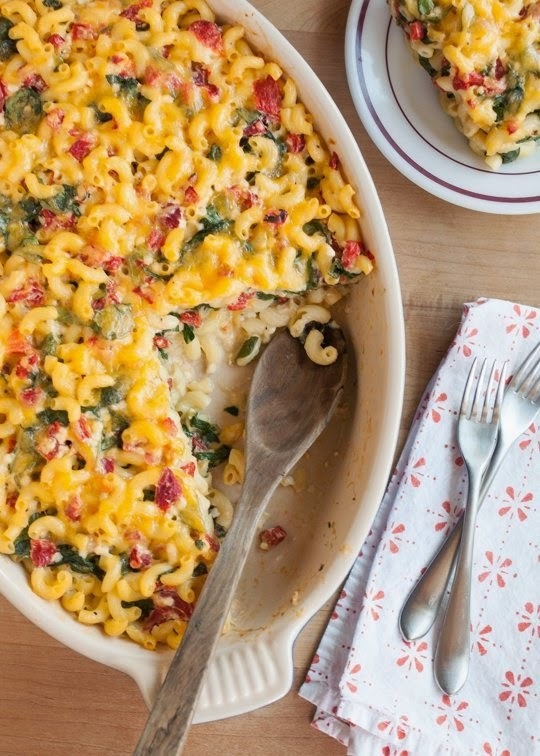 Put this casserole on your list — it’s a veggie-filled riff on baked mac ‘n’ cheese that doesn’t require a roux or even much prep at all, beyond cooking the pasta. It hits that sweet spot of comfort food that has enough redeeming nutritional qualities to justify having it both for dinner and lunch the next day. 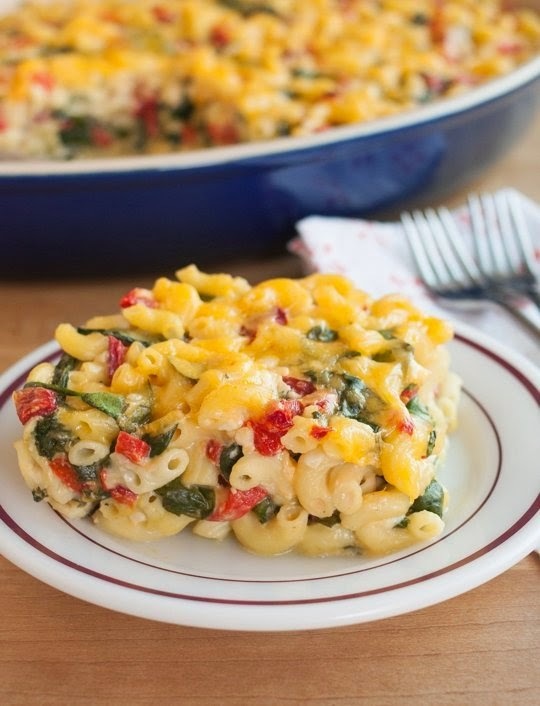 This “lighter” baked macaroni and cheese casserole relies on a combination of cottage cheese, sour cream, and shredded cheese for its creamy base. This somewhat surprising combo is one I’ve been using for years, ever since discovering it in Heidi Swanson’s recipe for Mushroom Casserole on her blog 101 Cookbooks. I love this sauce because it requires zero stovetop cooking or fussing with a roux to make béchamel, and it’s just as creamy and satisfying. If you’re not a fan of cottage cheese or even (gasp!) sour cream, never fear — everything melts together into one deliciously cheesy sauce. I’ve made this casserole with both whole and low-fat versions of cottage cheese and sour cream, and honestly, I couldn’t tell much of a difference. If you’re looking to shave a few more calories off this dish, this is definitely an option. Just stay away from no-fat versions — they’ll work, but you can definitely tell that the dish is lacking some essential awesomeness. 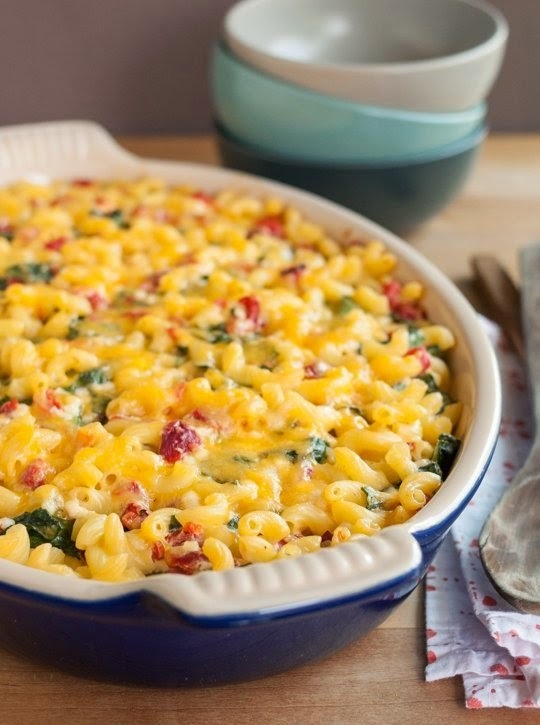 The only thing that needs cooking before throwing this casserole in the oven is the pasta. You can also assemble the whole shebang the evening or the morning before and put it in the oven when you walk in the door (just extend the initial, covered, cooking time by about 15 minutes). 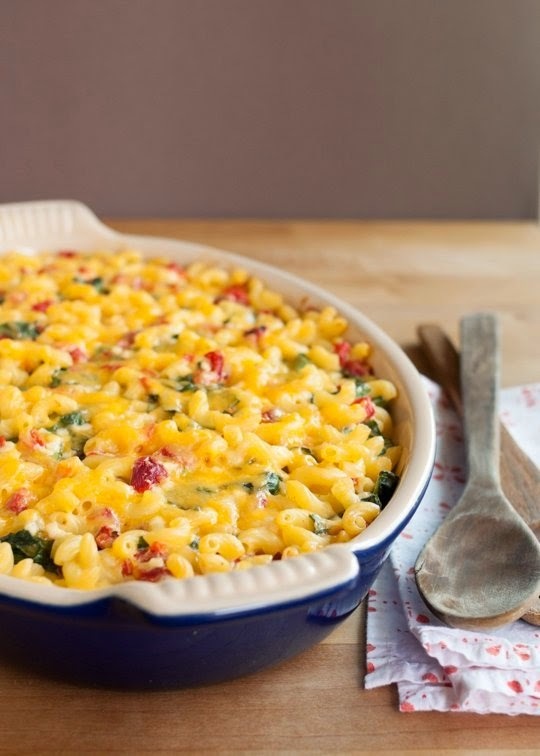 This casserole can also be frozen, uncooked or cooked; just cook the pasta very al dente so it doesn’t get mushy. Are you craving this yet? I hope so. I can’t wait for dinner tonight. Bring a large pot of water to boil. Salt the water generously and add the macaroni. Cook until the pasta until it’s just barely al dente — a little bit of chew is fine here. Drain and immediately transfer the hot pasta to a large mixing bowl. To freeze: The entire casserole can be frozen, baked or unbaked, but cook the pasta very al dente so it doesn’t get mushy. Warm baked casseroles in the microwave or a low oven until warmed through. Cook unbaked casseroles straight from the freezer for an hour, then uncover, top with cheese, and continue baking until bubbly.